In the past all kinds of different methods of translating foreign currency financial statements existed, called current rate method and temporal rate method. An important additions is that for (b) it is also allowed to use a rate that approximates the exchange rates at the dates of the transactions, the average rate for the period (year, quarter, month). However, if exchange rates fluctuate significantly, the use of the average rate for a period is inappropriate [IAS 21.40]. Investor Company Ltd. (‘Parent’) formed Subsidiary Company Ltd.(‘Subsidiary’), a foreign operation, on 30 June 19X0. It subscribed the issued capital of FC100,000 and raised a further FC200,000 in the form of a 5 year loan (repayable in 5 equal annual instalments on 30 June of each year). Fixed assets of FC201,701 were also acquired on 30 June 19X0. During the year to 30 June 19X1 a representative average exchange rate was FC1.0 = CU1.80. 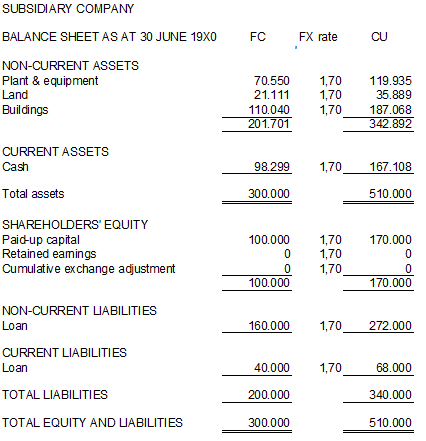 At 30 June 19X0, Investor Company would have consolidated the above balance sheet by simply eliminating the issued capital of Subsidiary Company against its investment in that company and aggregating all remaining line items (this is demonstrated below for the year ended 30 June 19X1). 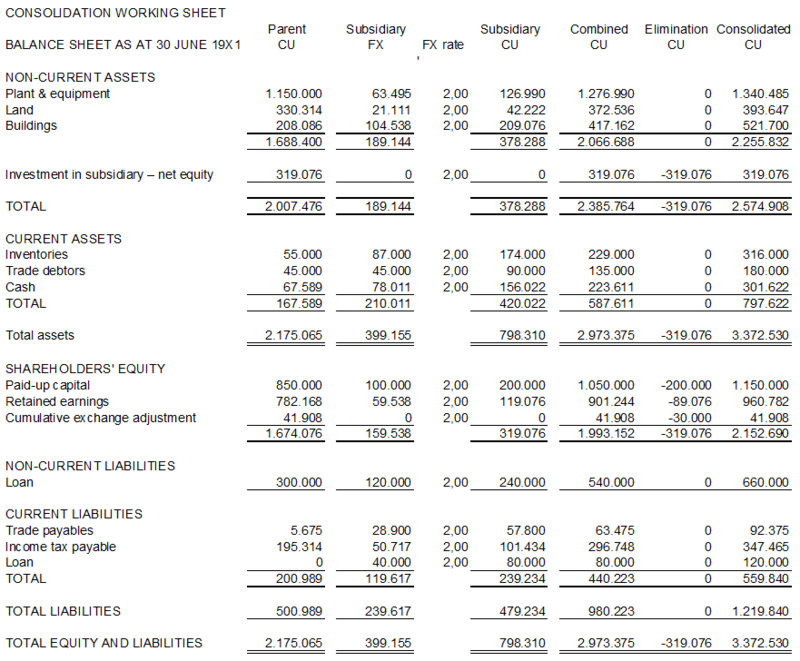 The consolidation worksheets for the two companies are shown for the period ending 30 June 19X1. the recalculation of the net profit of FX59,538 at average rate (1.80) in the income statement to closing rate (2.00) in the balance sheet/financial position, or recalculated: at closing rate FX59,538 at 2.00 is CU119,076 minus the average translation CU107,168 from the income statement is CU11,908. 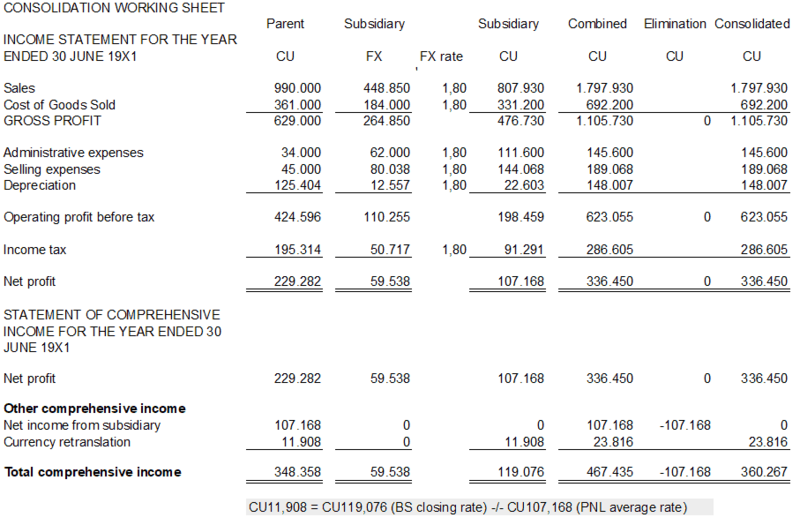 The currency retranslation average to closing combined of CU23,816 also is a double count (see reasonings above and consolidation working sheet details), eliminate CU11,908.